By Keith Cowing on October 31, 2008 2:00 PM. "While news of layoffs across the financial services spectrum have become commonplace from the implosion of Wall Street investment banks this year, the past week has produced a stunning array of new cutbacks across the rest of corporate America. ... Perotsystems is laying off 58 employees on Nov. 5 at Building 233a M/S 233-1 NASA Ames Research Center in Moffett Field." Editor's note: ARC Sources tell me that this is actually a book keeping issue - Perotsystems bought another company and the employees are still on the job. By Keith Cowing on October 31, 2008 9:14 AM. "The game would be called Float Ball. It would combine elements of basketball, football and the Lionel Richie video for "Dancing on the Ceiling" into a sort of free-for-all, compelling weightless players to bounce off walls, obstacles and one another while herding weightless balls of various colors to either end of the playing space, which would be placed inside the cabin of a zero-gravity plane or, possibly, on the moon. Eventually, one day, if all went well, some sort of custom arena would be constructed. On Mars." By Keith Cowing on October 31, 2008 8:06 AM. "At 17,000 feet above sea level, where the wind is a biting 20 below zero, an unlikely mountain climber nears his goal of ascending the world's tallest peaks. Jordan Romero, 3,000 feet away from tackling Alaska's Mount McKinley, has already conquered four mountains -- and he's 11 years old. "I've climbed Mount Aconcagua in South America, in Argentina, which is 22,834 feet. I've climbed Mount Elbrus in Europe -- it's located in Russia -- at 18,510 feet. That was quite a tough one," he said. "Mount Kosciuszko in Australia, that's 7,310 feet. That was quite a tough one just because of the weather, otherwise it would have been an easy, walk hike, just a long walk. And Mount Kilimanjaro of Africa in Tanzania, 19,340 feet." Continue reading The Next Generation of Explorers Is Already Exploring. By Keith Cowing on October 30, 2008 10:35 PM. "Ares is meant to be the rocket that will launch a new era of lunar exploration. Instead it is in danger of crashing into its own launch tower or of shaking its astronauts to death. ... The space agency admits that in certain conditions Ares could blast off into its own launch tower, and that other potential problems include the rocket vibrating so violently that its astronauts could die before they reach orbit." By Keith Cowing on October 30, 2008 9:29 PM. ""I would like to clarify several points in the News of the Week story (26 September, p. 1754) by A. Lawler, "Rising costs could delay NASA's next mission to Mars and future launches." When the National Research Council's Planetary Science Decadal Survey recommended the Mars Science Laboratory (MSL) mission for priority funding, it assigned a cost level of $650 million. This value, rather than $1.4 billion, is the true metric for seeing the deep damage that MSL's profligately overrunning cost--now likely to top $2.1 billion--has inflicted on NASA's Mars and wider planetary science budget. Also, the story focused its overrun discussion on instrument costs. Although certainly part of the problem, instrument cost increases have been considerably smaller than overruns in the rest of MSL's budget, which was severely mismatched to the project's complexity from its inception. This mismatch sowed the most fundamental seeds of MSL's cost problems." Continue reading MSL Commentary in Science Magazine. By Keith Cowing on October 30, 2008 9:14 PM. "Phoenix communicated with NASA's Mars Odyssey orbiter Thursday. The communication reinforced a diagnosis that the spacecraft is in a precautionary mode triggered by low energy. Mission engineers are assessing the lander's condition and steps necessary for returning to science operations." MarsPhoenix Twitter: "Take care of that beautiful blue marble out there in space, our home planet. Ill be keeping an eye from here. Space exploration FTW!" Veronica McGregor Twitter, JPL PAO: "Ah, just when you think it's all over, the 'sick child' phones home. Nice to know @marsphoenix is still trying, exceeding expectations." By Keith Cowing on October 30, 2008 9:02 PM. "Odyssey Moon Ventures LLC, a U.S. company developing commercial systems for lunar exploration, announced today that it has partnered with NASA for the development of a robotic lunar lander. The unique public-private partnership will combine NASA expertise with innovative approaches to commercial space systems, resulting in new industrial capabilities for the company and benefits to the American space program. The partnership was established through a Reimbursable Space Act Agreement signed with the NASA Ames Research Center on October 30th, 2008. Under the terms of the agreement, NASA will provide technical data and engineering support to Odyssey Moon Ventures in support of the company's efforts to develop its "MoonOne" (M-1) robotic lunar lander." By Keith Cowing on October 30, 2008 5:55 PM. "NASA managers completed a review Thursday of space shuttle Endeavour's readiness for flight and selected the official launch date for the STS-126 mission. Commander Chris Ferguson and his six crewmates are scheduled to lift off to the International Space Station at 7:55 p.m. EST on Nov. 14. 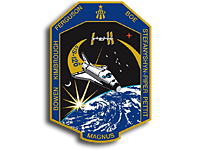 Endeavour's STS-126 flight will feature important repair work to the station and prepare it for housing six crew members during long-duration missions. The primary focus of the 15-day flight and its four planned spacewalks is to service the station's two Solar Alpha Rotary Joints, which allow its solar arrays to track the sun." By Keith Cowing on October 30, 2008 5:48 PM. "NASA managers have announced that they will not meet a February 2009 launch date for the fifth and final shuttle mission to the Hubble Space Telescope." The ground spare to replace a defective unit aboard Hubble will not be ready to support a February 2009 launch so a new launch date is needed. A significant anomaly occurred during testing. Six and a half months of testing is needed before the unit can fly. NASA's plan is to have the spare unit ready to ship in the April 2009 timeframe so as to support a May 2009 launch. By Keith Cowing on October 30, 2008 2:32 PM. Editor's note: This morning, at 7:30 am, before the STS-126 FRR began, a small ceremony was held whereby Virginia Whitehead received NASA's Lifetime Achievement Award from Mike Griffin. A special 10 minute video was played highlighting her career. Well done! By Keith Cowing on October 30, 2008 2:11 PM. "During a meeting Thursday at the Ministry of Education, Science and Technology (MEST) in Seoul, Korea, NASA's Assistant Administrator for External Relations, Michael F. O'Brien, and MEST's Director-General for Big Science, Munki Lee, signed a joint statement of intent identifying potential interest in cooperation in civil space and aeronautics activities." "Government officials have secured a commitment from NASA (National Aeronautics and Space Administration) to help the country's ambitions for a presence in space technology and to become more involved in international space research projects. The agreement signed between Korea's Ministry of Education, Science and Technology and NASA, Friday, calls for expanding exchange in technological advancements and further cooperation on a wide range of projects such as lunar exploration and manned space flights, the ministry said." By Keith Cowing on October 29, 2008 9:35 PM. "NASA'S Phoenix Mars Lander entered safe mode late yesterday in response to a low-power fault brought on by deteriorating weather conditions. While engineers anticipated that a fault could occur due to the diminishing power supply, the lander also unexpectedly switched to the "B" side of its redundant electronics and shut down one of its two batteries. During safe mode, the lander stops non-critical activities and awaits further instructions from the mission team." By Keith Cowing on October 29, 2008 4:28 PM. "On Halloween in 2003, the sun unleashed a series of spooky storms, which ignited lots of ghostly looking auroras, and effected power grids, satellites and other electrical equipment. On the fifth anniversary, NASA takes a look back at the Sun." Continue reading Today's video: 2003 Halloween Solar Storms. By Keith Cowing on October 29, 2008 1:48 PM. "NASA will host a media teleconference Wednesday, Oct. 29, at 1 p.m. EDT, to brief reporters about recent developments and ongoing progress in NASA's Constellation Program. Constellation will build the spacecraft to carry astronauts to the International Space Station and return humans to the moon by 2020." Doug Cooke: Some recent news reports about Ares have been inaccurate and draw false conclusions. PDR: In all cases we reviewed the approach resolving issues (such as vehicle drift) and are confident that there is a valid and straightforward path to resolve this - in some cases multiple paths. Jeff Hanley: Up and running for about 3 years. 5 major procurements, 4 prime contractors on board. We have real hardware in flow - some of it on the way to KSC for flight tests in CY 2009. J2x reviews ahead, tooling for upper stage being delivered, solidifying schedules for new launch date - IOC first crew launch by Sep 2014. Working under a CR this year - funding is tight. Working on a study - Ralph Roe leading it out of NESC - acceleration of Constellation in the event that new Administration/Congress wants to ask us to do that. Press event in Mid-November at KSC - we want to show flight hardware for Ares 1-X. Steve Cook: Ares is making outstanding progress toward flight. Ares 1-X delivering flight hardware to the Cape. Biggest accomplishment to dat - 1100 reviewers at PDR - 31 member PDR board approved. Identified challenges. Thrust Oscillation - team is pursuing 3 approaches to mitigate oscillations. Isolaters between 1st and second stage; looking at how we may use composite structures and optimize them for de-tuning, reaction mass actuators that actively cancel TO. Other challenges - environments and staging events, process control, making sure that process to resolve interface issues, enhancing operability. Claims that PDR earned a low score are not true - we rate according to color code. We do not use these as letter grades. Astronaut office revolt - not true. Crew office is not shy about expressing their opinions. Brent Jett: Astronaut office has been invloved in early conceptual process. Steve Cook: Another inaccuracy: Liftoff drift is a setback. Inaccurate. Liftoff drift happens due to wind and can be dealt with. Ares 1 can steer away from tower. We are cocnerned with 34 nm/hr winds from the southwest. This happens infrequently and the issue has been taken out of context more than it needs to be. NASA has not relaxed its safety requirements. I asked Steve Cook if MSFC has reported back to HQ after being asked to do a 30 day look at how their recent ARES PDR was conducted - including the bad reviews that review got internally. Cook replied that NASA HQ has not directed them to do a 30 day review. What they did after the PDR was to invite people to make comments at a pause and learn activity on how they think various things went. Some things that were not good. "As you can imagine, with 1100 people, we'll have issues with process and doing things in timely manner. You are going to have issues with process. The purpose is to improve for upcoming CDRs. We found nothing particularly alarming or surprising. These are typical things that you can expect. This will not affect the Delta PDR which will focus on thrust oscillation. I asked Jeff Hanley if he thought it was proper to state in NASA staff meetings that he thought that the manner in which the Orlando Sentinel reported things had to do with the way they run their company and current business climate. Hanley replied "I am entitled to my opinion and to share what I hear but I do not have facts one way or the other. That is hearsay on the part of my staff members." By Keith Cowing on October 29, 2008 12:32 PM. "For many in my generation it was the Apollo program or Star Trek that sealed our future with NASA. For me it was the original voyages of the Starship Enterprise. Yes, I am one of those that would love to see the mission of the agency to be, "To Boldly Go where No one has gone before." My expectation was that upon entering the gates of NASA, I would find someone working on the Warp drive or a transporter. I thought that there would be people working on projects that pushed the boundaries of space and time. I expected Mission Control to look like the deck of the Enterprise. Instead, I found the Apollo Mission Control configuration that worked exceedingly well into the late 1980's." By Keith Cowing on October 29, 2008 11:25 AM. The ColabSpace Twitter is now online. OnOrbit ColabSpace provides a collaborative wiki mashup environment for individuals, groups, organizations, or companies to work on a variety of wikis or projects related to space, be it commercial space, space exploration, Moon, Mars, Astrobiology, space elevators and a myriad of other topics. Does SciFi Hurt Space Exploration - or Help it? By Keith Cowing on October 29, 2008 10:19 AM. "It's not often that our real life science heroes utter disparaging remarks against science fiction. In fact, the opposite is usually true; science fiction is often cited as a source of inspiration and interest. Enter Buzz Aldrin, who caused a stir recently with some comments he made. To get a few more opinions, we asked the following of this week's panel: ..."
By Keith Cowing on October 29, 2008 10:00 AM. "NASA will hold a Science Update at 1 p.m. EDT on Wednesday, Oct. 29, to announce findings and release new images from the Oct. 6 flyby of Mercury by a NASA spacecraft. The briefing will take place in the television studio at NASA Headquarters, located at 300 E Street, S.W., in Washington. It will be carried live on NASA Television." By Keith Cowing on October 29, 2008 8:58 AM. "Lloyd began his full-time career with NASA as Electronics Engineer at its flight facility on Wallops Island, VA. His work with NASA then took him to the Kennedy Space Center and, following a promotion in 1987, Lloyd accepted a position at NASA HQ in Washington, DC. During that time Lloyd lived with his wife and three children in Reston, Sterling and Woodbridge, VA. In 1991 he accepted a new position with the Kennedy Space Center and has lived with his family in Merritt Island since then." By Keith Cowing on October 29, 2008 8:57 AM. "Leon J. Kosofsky, 88, a retired NASA photogrammetric engineer who created detailed maps of the moon's surface, died Oct. 10 at his home in Bethesda. He had melanoma. Mr. Kosofsky joined the space agency in the early 1960s. As a project engineer for the Lunar Orbiter program of unmanned photographic satellites, he created maps of the moon to help locate places for manned missions to land." Phoenix At An End? Or Just Deep Sleep? By Keith Cowing on October 29, 2008 12:33 AM. "Originally scheduled to last 90 days, Phoenix has completed a fifth month of exploration in the Martian arctic. As expected, with the Martian northern hemisphere shifting from summer to fall, the lander is generating less power due to shorter days and fewer hours of sunlight reaching its solar panels. At the same time, the spacecraft requires more power to run several survival heaters that allow it to operate even as temperatures decline." By Keith Cowing on October 28, 2008 8:28 AM. Editor's 27 Oct update: This chart shows one of the scenarios where winds could cause the Ares 1 to drift toward the launch tower and possibly damage it with its plume. Click on image to enlarge. "One NASA engineer, who has participated in studies of Ares I performance, told New Scientist the rocket's design needs a complete rethink: "You might as well change gears and work on a design that is going to be successful." "The head of NASA's Ares rocket program defended the design of the launch vehicle Monday, dismissing critics that claim it would be unstable at launch. Recent published reports say the Ares rocket could drift during launch because of winds, striking the tower. However, all rockets move during launch, said Steve Cook, manager of the Ares program at Marshall Space Flight Center." "Now, in the latest setback to the Ares I, computer models show the ship could crash into its launch tower during liftoff. The issue is known as "liftoff drift." Ignition of the rocket's solid-fuel motor makes it "jump" sideways on the pad, and a southeast breeze stronger than 12.7 mph would be enough to push the 309-foot-tall ship into its launch tower. ... Internal documents and studies obtained by the Orlando Sentinel appear to support concerns expressed by Finckenor and others. Nonetheless, NASA's leaders maintain that Ares will be ready for launch in 2015." Astronauts, whose prime concern is safety, are still not happy. Leroy Chiao, a former space-station commander who retired in 2005, stays in touch with his colleagues. "I would say that I have heard various concerns," he said. "If I were still in the corps, I'd be skeptical about when is this thing going to fly and will we be able to put all the fixes in place." By Keith Cowing on October 27, 2008 7:22 PM. "A former chairman of the House science committee told Brevard County leaders Monday that NASA's next rocket is "on the chopping block" and that a new administration may abandon the Ares I as successor to the space shuttle. The next president may look instead to use military rockets to launch NASA astronauts, said Robert Walker, a former Republican congressman from Pennsylvania who, as a Washington-based lobbyist, represents Brevard County. Walker told county commissioners; U.S. Reps. Tom Feeney, R-Oviedo, and Dave Weldon, R-Indialantic; and representatives of the local aerospace community that the word in Washington and at recent space conferences was "that Ares I could be on the chopping block." Afterward, in an interview with the Orlando Sentinel, he elaborated: "The discussion I am hearing in the space community is that Ares will certainly be reviewed by the next administration." By Keith Cowing on October 27, 2008 1:58 PM. "Qualified applicants must: a) be Canadian citizens or permanent residents in Canada ... The successful applicant will play a key role in an exciting, unique, and cutting-edge international effort to advance the exploration of the Earth, moon, Mars, and space. The HMP Logistics Manager will be required to be based in Canada and work mainly from his/her private home in the Vancouver, BC, area. Home office connectivity and employment-required operations costs (excluding rent) will be supported directly by the Mars Institute." By Keith Cowing on October 27, 2008 10:53 AM. Editor's note: From the National Academies: "The following reports are tentatively scheduled for release during November. However, release dates of National Academies reports depend on successful completion of the review process and publishing schedules: Launching Science: Science Opportunities Enabled by NASA's Constellation Program [National Research Council] Assesses potential space and earth science studies that could be addressed by taking advantage of the launch vehicles and spacecraft being developed by NASA for the Constellation Program." By Keith Cowing on October 25, 2008 8:04 PM. "Obviously the design criteria for four wheeled vehicles are somewhat different on other planets. This has yielded some of the most bizarre and fascinating vehicles ever proposed, from the giant Mobility Test Article test driven by Wernher von Braun to todays rovers which have ditched the most expensive component of all, the driver. Here are a variety of some of both classic and unusual space rovers from prototype to flown." By Keith Cowing on October 25, 2008 6:11 PM. "Armadillo Aerospace team leader John Carmack wore a big smile yesterday as the team earned $350,000 in prize money for winning Level One of the Northrop Grumman Lunar Lander Challenge in Las Cruces, New Mexico. In addition to officials from NASA and other space-industry organizations, New Mexico Governor Bill Richardson was on hand to witness the victory and to show his support for the private spaceflight industry. Armadillo made an attempt at Level Two of the Challenge today, but experienced technical problems that prevented them from accomplishing a successful flight." Continue reading Northrop Grumman Lunar Lander Challenge Streaming Video. By Keith Cowing on October 25, 2008 6:04 PM. "While India has just entered the list of moon-mission countries, the pioneer and global leader is aerospace projects US-based National Aeronautics and Space Administration (NASA) seems to have taken India very seriously. NASA is on the verge of taking a decision to set up its largest non-US centre near Pune, which would necessarily be a huge theme park. ... The proposed theme park would come up along the backwaters of Varasgaon dam on a 300-acre huge piece of land, which is part of the controversial Lavasa Lake City promoted by Hindustan Construction Company (HCC). NASA plans to invest more than Rs 150 crore over this project. Located around 45 kilometers west of Pune, the theme park would be aimed at attracting youngsters and tourists towards NASA's activities. NASA is also giving a thought to set up a research and development centre at this venue, which would primarily be aimed at new technologies and space browsing, sources claimed." Editor's note: I cannot imagine that this story - posted by an otherwise respectable publication - is remotely close to being true. That said, many of you seem to think there is a possibility that it could be true. Get a grip, folks. By Keith Cowing on October 24, 2008 5:36 PM. "We need to ensure a fully coordinated approach for Education and Public Outreach activities so that Agency efforts which have broad reach and benefit to the public are at the top of the list to receive funding. Examples of activities which were not prioritized due to a lack of coordination include: the production and distribution of public service announcements, the creation of public outreach Web sites outside the nasa.gov portal, the commissioning of music or artwork, documentary video production (beyond normal B roll video), and the hiring of marketing agencies to conduct public surveys. These and other Education and Public Outreach activities must be coordinated and vetted through the Office of Strategic Communications to ensure that the highest priorities, with the greatest benefit to the Agency's mission, are being funded and that we are not engaged in activities which could be considered marketing." By Keith Cowing on October 24, 2008 12:20 AM. "Commander Sergei Volkov and Flight Engineer Oleg Kononenko of the 17th International Space Station crew landed on the steppes of Kazakhstan at 11:37 p.m. EDT Thursday after more than six months days in space. All three people aboard the Soyuz TMA-12 spacecraft were reported to be in good condition after their re-entry and landing. A Russian recovery team and NASA personnel reached the landing site by helicopter shortly after the Soyuz touched down. They helped the crew members into reclining chairs for medical tests and set up a medical tent nearby." By Keith Cowing on October 23, 2008 5:17 PM. "The Hubble Space Telescope Science Instrument Control and Data Handling system was reactivated on Thursday, October 23. This should enable Wide Field Planetary Camera-2 science observations to resume on Saturday, October 25. The Advanced Camera for Surveys Solar Blind Channel science observations should resume later next week. The Independent Review Team, chaired by Wallops Flight Facility director John Campbell, and the HST Program reported their assessment to Goddard management yesterday." By Keith Cowing on October 23, 2008 5:03 PM. "NASA is in the inspiration business. If you don't know what I mean, take a trip to your local school and engage in a discussion with students. Ask them what inspires them. At the heart of most discussions, is space exploration. .... If you find this presentation helpful, please use it, pass it on to others, and share the story. As always, we appreciate constructive comments - and will work to continuously update this presentation and post it on this site for your benefit. Enjoy!" By Keith Cowing on October 23, 2008 4:49 PM. CNN: Teachers on zero-gravity trip: "Schoolteachers take a zero-gravity flight to help inspire their students to learn about science and space." Continue reading Today's Video: Northrop Grumman ZeroG Flights for Teachers. By Keith Cowing on October 23, 2008 3:07 PM. "Hopes for large lakes of frozen water at the Moon's poles have taken another bashing, with new images of a prominent crater revealing dull lunar dust instead of shiny pools of ice. ... But Alan Smith, director of the Mullard Space Science Laboratory at University College London, disagrees: "If [water ice] is present at levels of just a few percent, it could be very useful for future missions. In fact, small crystals within a sandy mixture may be even easier to process." By Keith Cowing on October 22, 2008 9:43 PM. "The Ministry of Defence is lending the team engines that were used in the flight development programme for the Typhoon. These test engines are beyond combat use but have more than sufficient working time left in them to power Bloodhound. The EJ200 will produce about 20,000 lbs of thrust (90 kilonewtons) and will sit underneath a hybrid rocket engine that produces about 25,000 lbs of thrust (110kN). The rocket will provide most of the power to get Bloodhound close to the speed of sound (Mach 1); the Typhoon engine will enable Andy Green to throttle up to the target speed of 1,000mph (Mach 1.4)." Editor's note: Wouldn't it be interesting if NASA were to combine its recent interest in NASCAR with what the Rocket Racing League is up to and provide surplus engines, etc. By Keith Cowing on October 22, 2008 2:44 PM. Editor's note: Two videos are now online. One shows the launch of Chandaryaan-1. The other provdes a mission overview. Continue reading Chandaryaan-1 Launch and Mission Overview Videos. By Keith Cowing on October 22, 2008 12:14 PM. "NASA and the Challenger Center for Space Education have partnered to engage students in ongoing activities for one of NASA's concepts for astronaut housing on the moon through a contest to name a habitat in Antarctica. NASA currently is conducting a test of a lightweight, durable, inflatable habitat on the cold, harsh landscape of the National Science Foundation's McMurdo Station." By Keith Cowing on October 22, 2008 10:50 AM. 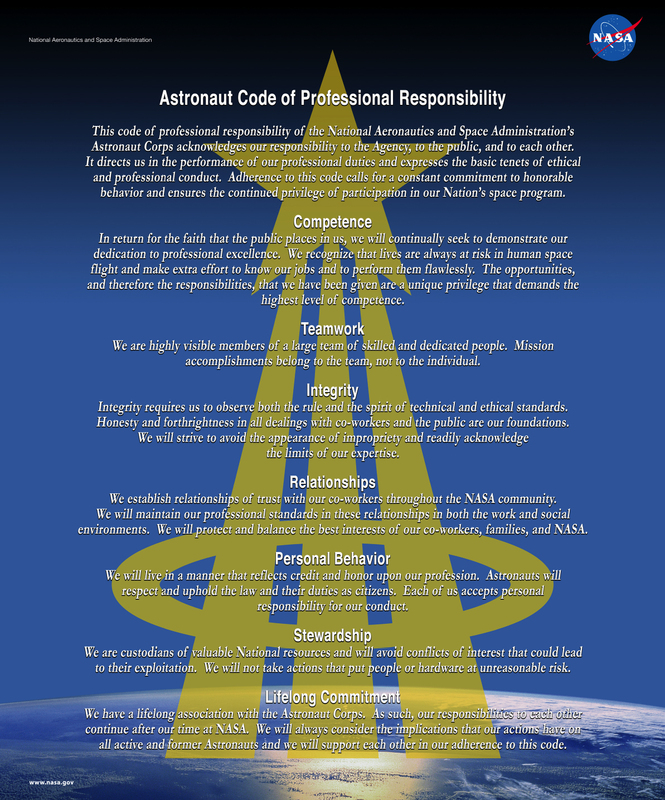 "For almost 50 years, NASA never thought it needed to tell astronauts how to behave, but the behavior of Lisa Nowak comes immediately to mind when reading NASA's new astronaut code of conduct." "3. The report recommends NASA establish and enforce an astronaut code of conduct. What plans are there for a code of conduct? 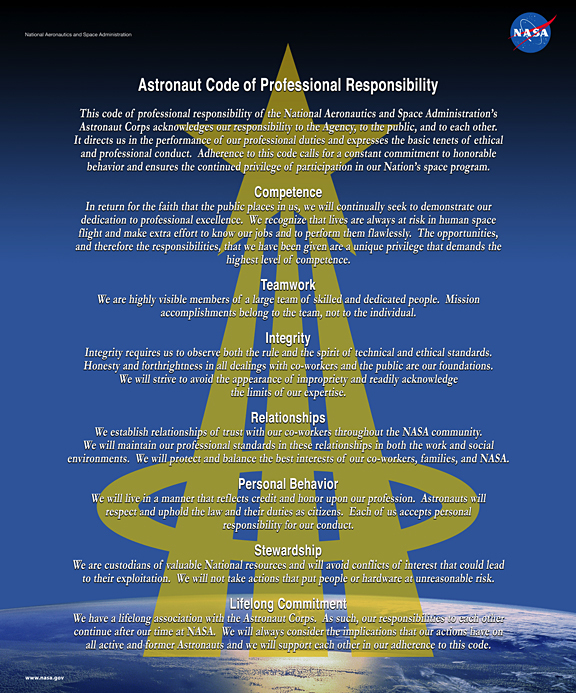 JSC managers, including officials within the astronaut office, have been discussing an astronaut code of conduct prior to this report. NASA accepts the recommendation and is NASA is reviewing how such a process will be collaboratively implemented. We're not going to speculate on what such a code of conduct might include." "The absence of a code of conduct and its enforcement, and the lack of management action to limit inappropriate activity increases the likelihood of aberrant behavior occurring and decreases the likelihood of such behavior being reported." By Keith Cowing on October 22, 2008 9:13 AM. "In its fourteenth flight conducted from Satish Dhawan Space Centre (SDSC) SHAR, Sriharikota this morning (October 22, 2008), the Indian Space Research Organisation's (ISRO's) Polar Satellite Launch Vehicle, PSLV-C11, successfully launched the 1380 kg Chandrayaan-1 spacecraft into a transfer orbit with a perigee (nearest point to Earth) of 255 km and an apogee (farthest point to Earth) of 22,860 km, inclined at an angle of 17.9 deg to the equator." "Paul Spudis, a noted U.S. planetary geologist with the Lunar and Planetary Institute in Houston, is blogging the launch of India's first lunar mission, Chandrayaan-1, which lifted off early Wednesday morning from India's east coast." By Keith Cowing on October 21, 2008 8:11 PM. "Unfounded criticism of America's next-generation moon rocket is hurting NASA morale but hasn't stopped progress on the craft, the space agency's administrator Michael Griffin said Tuesday. Griffin said critics in the media and on anonymous Internet blogs can "chip away" at the agency by questioning the motives and ethics of engineers designing the new rockets. Briefing charts used by NASA managers sometimes show up on Web sites without the proper context, he said, and opponents of the agency's plans to replace the space shuttle with two new rockets have wrongly accused NASA managers of incompetence and worse." Editor's note: Point taken. There is no excuse for sloppy blogging/journalism, incorrect facts, not placing things into context. etc. That said, all I can say is poor NASA - stuck in the 20th Century. A decade ago there was only NASA Watch. Now there are hundreds of space blogs. Soon there will be thousands. Get used to it. NASA needs to adapt to the world that it exists in, Mike. The world is not going to wait for NASA to catch up. And with the collective, time-compressed, multitasking ADD exhibited by the younger, digital generation, this situation is only going to be compounded. The private sector is adapting. Why can't NASA? P.S. When the participants in a PDR make comments such as these about serious flaws in the process of designing the Ares rocket, the public has a right to know - as does the rest of the agency's workforce. By Keith Cowing on October 21, 2008 5:22 PM. "The appellate judges on Tuesday questioned whether Nowak waived her rights before the interview and what detectives knew before they searched her car. They wanted to know if detectives would have found Nowak's car without the help of her statements. Assistant Attorney General Kellie Nielan argued that Nowak voluntarily waived her Miranda rights by continuing to talk to detectives during the interview." By Keith Cowing on October 21, 2008 2:29 PM. "NASA/JSC intends to contract with Roscosmos for these services on a sole source basis for a period up to 4 years and 6 months, through June 30, 2016. NASA/JSC intends to issue a modification to add Firm-Fixed-Price Indefinite Delivery/Indefinite Quantity (IDIQ) provisions to order these services on an as-needed basis (until alternative providers reach full operational capability). These services are being procured through Roscosmos because the Soyuz is the only proven crew transportation and rescue vehicle (other than the Space Shuttle which is scheduled for retirement in September 2010) currently compatible and able to dock to the International Space Station and capable of providing the needed services. The Government does not intend to acquire a commercial item using FAR Part 12. See Note 26." Is Shuttle Retirement a Good Idea or a Bad Idea? By Keith Cowing on October 21, 2008 1:09 PM. "Keeping the space shuttle program going past its planned retirement date of 2010 is a "bad idea" and would rob development money from its replacement, the Ares I rockets now being developed at Marshall Space Flight Center, said Marshall Director Dave King this morning." "In a rational world, we would have been allowed to pick a Shuttle retirement date to be consistent with Ares/Orion availability, we would have been asked to deploy Ares/Orion as early as possible (rather than "not later than 2014") and we would have been provided the necessary budget to make it so. I realize that no one on this distribution disagrees with me on this point, I'm just saying it again, that's all." By Keith Cowing on October 21, 2008 11:46 AM. "By comparison, the $25,000 that NASA paid for a portrait of former administrator Daniel S. Goldin and the $29,500 that the Environmental Protection Agency spent for one of the outgoing administrator, Stephen L. Johnson, look like bargains." By Keith Cowing on October 21, 2008 10:56 AM. "It is obvious that this status of a reliable international partner should be constantly upheld," Putin told the special meeting in Krasnoyarsk region in Siberia. U.S. space agency NASA plans to mothball its entire Space Shuttle fleet by 2011. "Evidently ... between 2011 and 2016 the United States will not possess a new spaceship to replace the Space Shuttle," news agencies quoted Anatoly Perminov, the head of Russia's space agency Roskosmos, as telling Putin. "So Russian spacecraft will bear the brunt of transportation and maintenance works, as well as replacing (ISS) crews and launching European and Japanese cargo ships from time to time." Editor's note: Gee, and when their space program was collapsing in the 1990s who propped it up, wrote big checks, etc.? Thanks a whole heap, tovarich. By Keith Cowing on October 21, 2008 9:40 AM. "SpaceDev, Inc. announced [Monday] that it has signed an agreement to be acquired by privately-held Sierra Nevada Corporation (SNC). Under the agreement, SNC would acquire for cash the outstanding equity of SpaceDev for the gross purchase price of $38 million, which after certain deductions is expected to result in a net price to holders of SpaceDev common stock between $0.68 and $0.72 per share. The expected price represents a premium of between 42% and 50% over the average closing price of SpaceDev's common stock over the 30 trading days preceding this announcement." By Keith Cowing on October 21, 2008 9:33 AM. "Northrop Grumman Corporation has named Lon L. Rains director of communications for the company's Space Technology sector, where he will guide efforts to increase the visibility of the company's capabilities in civil and military space, missile defense and high-energy lasers." By Keith Cowing on October 21, 2008 12:24 AM. "Forty years after flying NASA's first manned Apollo mission, the crew of Apollo 7 was honored on Friday with the space agency's highest award, the NASA Distinguished Service Medal. The presentation at long-last recognized the crew's contributions to the United States' first lunar landing program, granting Wally Schirra, Donn Eisele and Walt Cunningham the same award that all of their fellow flown Apollo astronauts received almost four decades earlier." By Keith Cowing on October 21, 2008 12:07 AM. ... The note from Jim came on the heels of a hurtful criticism of my blog. I was reminded of an incident that happened when I was a teenager. I had to play a Mozart French Horn concerto. I made a mistake, freaked out and ran off the stage crying. The band director made me play again. I practiced more and made it through, but barely. I don't think I ever recovered from that stage fright; and there are many times when this blogger wants to run off the stage crying, but I blog." Editor's note: You Just Keep On Blogging, Linda. NASA gets better every time you do. By Keith Cowing on October 20, 2008 6:36 PM. "At 9:15 a presentation about the Ares project will be held. Also featured in later discussions will be Steve Cook, head of Ares development at Marshall, along with Ares project managers." "Too many people involved in the planning phase, meetings were too large"; "The integrated vechicle review did not present the element design issues (RIDs) so it was difficult to know if the parts added up to a rocket that will fly"; "The review occurred to close to the element PDRs, This did not allow for some of the element level rids to addressed or predeclared in documents"; "Much of the documentation presented for PDR was not mature enough for PDR. This limited an effective of these documents and left the impression that the PDR was rushed. "; "The RID screening rules and procedures seemed to change from day to day, like we were making it up as we went along. "; "Insufficient time was allotted to review the documents. "; "Not allowing RIDs to be written against the SRD and declaring it a finished document prior to the PDR was just arrogant and wrong. This was further evidenced and confused by the introduction of two version of the SRD, showing that it was in fact being changed behind the scenes." etc. By Keith Cowing on October 20, 2008 10:58 AM. Editor's note: Richard Garriott, private space explorer and son of NASA's Skylab Astronaut Dr. Owen Garriott, plans to talk with students through a NASA sponsored live video teleconference, broadcast via the Internet scheduled for Monday, October 20th at 12:30pm ET during his flight to the International Space Station. The downlink event will be held in Reston, Virginia in coordination with KZO Innovations with students from two D.C. Metropolitan area schools and four Challenger Learning Centers. Students will ask Mr. Garriott original questions about living and working in space. The event will be broadcast live at http://www.challenger.org. By Keith Cowing on October 20, 2008 10:18 AM. "David King, director of NASA's Marshall Space Flight Center in Huntsville, Ala., has awarded the Director's Commendation to members of the Hurricane Gustav rideout crew at the Michoud Assembly Facility in New Orleans for their outstanding effort in planning and implementing emergency operations to protect the facility. As Hurricane Gustav approached the Gulf Coast, the 51-person rideout crew stayed on the Michoud site to secure the facility, monitor the hurricane and ride out the storm. Its members include NASA civil service, Lockheed Martin contractor employees and Coastal International Security personnel." Editor's note: I was at MAF a matter of weeks after Katrina. I saw things in the faces of the people who worked there that I never expected to see. How and why they do things harkens back to another time. This is not the first time that these folks have taken significant personal risks to preserve critical aspects of America's human space flight program. They do so in a no-nonsense fashion - and when you ask them why, as I did, they say things such as "because its my job, sir". To those of you sitting behind desks at NASA: think of that later today when you stop what you are doing simply because your car pool is about to leave. During Katrina these people stayed on the job as their families and homes risked - or actually experienced - utter destruction. And then they lived at work for weeks sleeping on cots. By Keith Cowing on October 20, 2008 9:31 AM. "India began the countdown Monday to the launch of its first unmanned mission to the moon that will mark a giant catch-up step with Japan and China in the fast-developing Asian space race. The lunar-orbiting spacecraft, Chandrayaan-1, is scheduled to blast off aboard an Indian-built rocket at 6:20 am (0050 GMT) on Wednesday from the Satish Dhawan Space Centre in Sriharikota on India's southeastern coast. "Everything is going perfectly as planned," the centre's associate director M.Y.S. Prasad told AFP from Sriharikota, 80 kilometres (50 miles) north of Chennai, after the official countdown began in the early hours of Monday." By Keith Cowing on October 19, 2008 4:51 PM. "The NASA Authorization Act, H.R. 6063, which has passed both the House and the Senate, is awaiting signature by the President. It contains a new provision restricting National Aeronautics and Space Administration's (NASA) total authorized spending on conferences to $5 million in FY 09." By Keith Cowing on October 19, 2008 4:41 PM. "S. AMDT. 3318 to H.R. 3093 would require NASA to post details of all conferences it will sponsor during fiscal year 2008. Specifically the amendment requires NASA to post on its public Web site: the itemized expenses paid by the agency, including travel expenses and any agency expenditure to otherwise support the conference; the primary sponsor of the conference; and the location of the conference." Continue reading One Person Who Wants To Curtail NASA Meetings. By Keith Cowing on October 19, 2008 11:12 AM. "A database in National Aeronautics and Space Administration (NASA) categorized Taiwan as "Taiwan, Province of China". After blogger Su-bing exposed the news on his blog, groups of Taiwanese netizens sent protest letters to NASA. NASA changed the name back to Taiwan late at night on Oct 16." Prescient Forecast - Or Drinking the Koolaid? By Keith Cowing on October 18, 2008 9:31 PM. "James A. Abrahamson, a retired Air Force lieutenant general and the chairman of the NAC's Exploration Committee, praised the Constellation program to the Council at its quarterly meeting in Cocoa Beach, calling it the best program for the agency given its tight budget and schedule. "The NAC is confident that the current plan is viable and represents a well-considered approach given the constraints on budget, schedule and achievable technology," he said. He said that NASA considered more than 1,000 different rocketship designs before settling on the Ares rockets and Orion capsule which are at the heart of the Constellation program. Any attempt to rethink the plan, he said, would be bad for America's space program." By Keith Cowing on October 17, 2008 9:49 PM. Editor's note: I went over to the Udvar Hazy Annex of the National Air and Space Museum this evening for a reception honoring the New Horizons Mission. Specifically, the reception honored the placing of a high fidelity model of the New Horizons spacecraft in the museum - now suspended from the ceiling, aft of Space Shuttle Enterprise. During the dedication ceremony, we all learned from PI Alan Stern that the spacecraft was carrying a number of items, some of which had previously not been formally announced: some of Pluto discoverer Clyde Tombaugh's ashes, state quarters from Maryland and Florida, two CDs - one with over 400,000 names - the other with family photos of the New Horizons team, the US postal service stamp from 1991 saying "not yet explored", a concept design for another stamp noting the New Horizons mission, and a piece of Burt Rutan's SpaceShip One. Listening to the various presentations, it was quite clear that this was a family endeavor - as well as an endeavor of families - and generations. The people who worked long hours on this mission needed support from their families - while younger mission personnel are being groomed to be involved in 2015 - and beyond - when New Horizons reaches its prime target - and possibly future targets during extended mission operations. New Horizons is perhaps the first purposefully multi-generational space mission, the twin Voyagers having unexpectedly blazed that trail by virtue of good design and immense ingenuity. By Keith Cowing on October 17, 2008 8:01 PM. "The ExoMars rover, which will search for signs of life on the Red Planet, will not now launch until 2016 because of the high cost of the project. The 1.2bn-euro price tag is deemed to be too high by governments, and space officials have been asked to find ways to reduce it. One option may be to try to get greater involvement - financial and technical - from the Americans and the Russians." By Keith Cowing on October 17, 2008 2:45 PM. "Activation of Hubble Space Telescope science instruments and resumption of science observations has been suspended following two anomalies seen in systems onboard the telescope yesterday. The investigation is continuing. Contingency procedures for a potential switch to a hybrid SI C&DH configuration that would use portions of its Side A and portions of its Side B were tested this morning in HST Program's Vehicle Electrical System Test (VEST) Facility, a high fidelity mock-up of Hubble that resides in a cleanroom at Goddard." By Keith Cowing on October 17, 2008 9:18 AM. "The bill also solidifies funding for nine shuttle missions to the space station and it extends the agency's involvement in the space station until 2020. The measure also urges an additional shuttle mission to launch the Alpha Magnetic Spectrometer, a $1.6 billion-observatory that would be attached to the outside of the station." "NASA's long-standing practice of honoring retirees and contractors with lavish award ceremonies costing millions of dollars a year may be over. 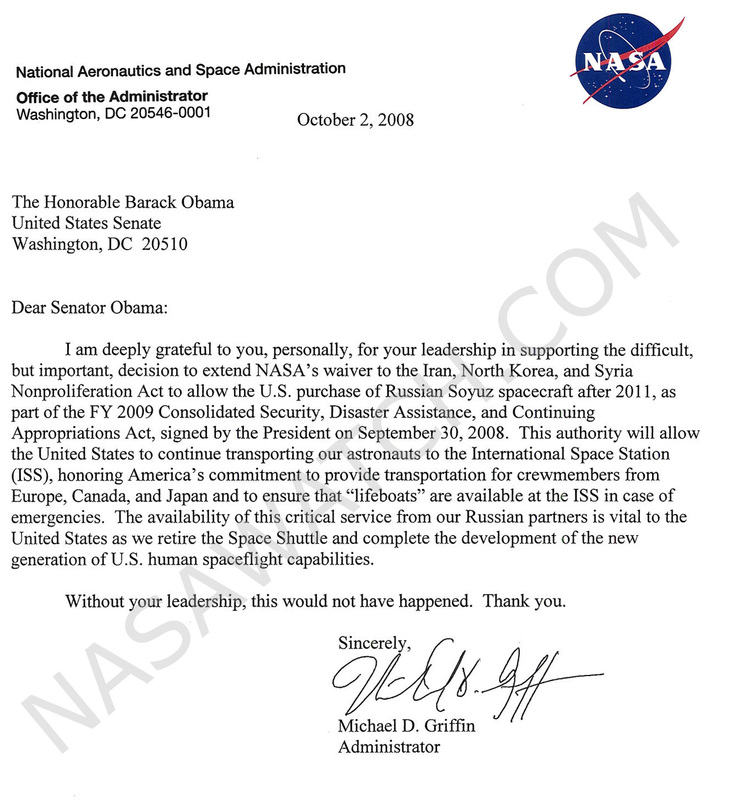 President Bush signed the NASA Reauthorization Act providing funding for the agency as well as tough new restrictions on conference spending." "CCAGW's research arm, Citizens Against Government Waste, issues "Prime Cuts," which contains "701 spending cut recommendations across the entire federal budget totaling nearly $2 trillion over five years. ... It also makes tough calls, like canceling the NASA Mars Initiative for a savings of $11.5 billion over five years." By Keith Cowing on October 16, 2008 4:58 PM. "NASA Advisory Council Chairman Harrison "Jack" H. Schmitt announced Thursday he was leaving the council. Fellow council member Kenneth Ford will succeed him as chairman effective immediately. The NASA Advisory Council provides advice to the NASA administrator on important program and policy matters related to the U.S. space program." By Keith Cowing on October 16, 2008 10:09 AM. "The Hubble Space Telescope team completed switching the required hardware modules to their B-sides about 9:30 a.m. this morning and received telemetry that verified they had good data. Everything at this point looks good." "At 284/14:25:46 UTC, the SSM HV Protection capability through the NSSC-1 was successfully restored via Ops Request 18307-0. Executive RTCS 21 was enabled to send notification of an HV Protect event through the setting of the former Mechanism Motion flag, and NSSC-1 Global Event Flag 12 was set to allow this transfer across the PIT to the SSM." By Keith Cowing on October 15, 2008 11:14 PM. White House Statement: "H.R. 6063, the "National Aeronautics and Space Administration Authorization Act of 2008," which authorizes appropriations to the National Aeronautics and Space Administration (NASA) for Fiscal Year 2009; requires NASA to add to its baseline flight manifest two Space Shuttle missions to the International Space Station and take all necessary steps to fly a third additional Shuttle mission; requires NASA to take steps to ensure that the International Space Station remains viable through at least 2020; and affirms congressional support for U.S. space exploration policy;"
"The Space Shuttle must be retired by the end of 2010, and the NASA Administrator's authority to make the final determination on Shuttle flights based on safety considerations must be preserved. In addition, any increased cost of an additional Shuttle flight must be satisfactorily accommodated within the President's proposed discretionary spending total." By Keith Cowing on October 15, 2008 10:56 PM. Editor's note: I was walking down 8th Avenue in New York this evening with astronaut Scott Parazynski after dinner with Leroy and Karen Chiao, my wife, Scott, and noted sailor Alex Whitworth when I spotted a familiar face: Peter Smith. He was about to walk into an event sponsored by Popular Mechanics: Breakthrough Awards which honors a number of technological innovators including those behind the Mars Phoenix Lander. Leroy, Scott, and I are in town for the Explorers Club Lowell Thomas Annual Dinner tomorrow night. Scott and Leroy are among the award winners. Small world. By Keith Cowing on October 15, 2008 10:46 PM. Editor's note: Another gem from the Washington Examiner: "Turns out that pop star Janet Jackson may have more in common with astronauts than her nutsy moon-walkin' brother Michael Jackson ever dreamed of. Jackson, Janet, has had to cancel appearances because of a condition called "vestibular migraine"--which sounds a lot like the vestibular disturbances of space adaptation syndrome (SAS)--or space sickness." "Sounds a lot like" Hmm. Lets Google up some quotes with similar words. But talk to an expert on the topic and see if there is any relationship between these two topics? Nah. By Keith Cowing on October 15, 2008 7:13 AM. "Northrop Grumman Corporation will debut the Northrop Grumman Foundation Earthwatch Educator program, an innovative environmental education program for teachers at the 2008 National Conference on Aviation and Space Education (NCASE). The company is one of the sponsors of the conference, ``Today's Students: Tomorrow's Aerospace Workforce,'' which will be held at the Crystal Gateway Marriott Hotel in Arlington, Va., on Oct. 16-18. In partnership with the Earthwatch Institute, the Northrop Grumman Foundation will offer educators across the country the opportunity to participate in expeditions focused on climate change or oceans preservation." By Keith Cowing on October 14, 2008 11:00 PM. "It's hard to believe, but Oct. 15 will be the 1,000th day of flight for New Horizons. And in that time we've traveled so far that only four other spacecraft - Pioneers 10 and 11 and Voyagers 1 and 2 - have ventured farther. Can you believe it's been this long? Sometimes it seems so, but other times, it seems like we just blasted off from Florida on that cool afternoon of Jan. 19, 2006." According to the NewHorizons2015 Twitter: "At 1400 Eastern tomorrow we begin our 1000th day of flight. Onward, onward now, ever toward the frontier!" By Keith Cowing on October 14, 2008 11:34 AM. "NASA will host a media teleconference at 12:30 p.m. EDT, Tuesday, Oct. 14, to brief reporters about the status of efforts to revive the data handling unit that failed on the Hubble Space Telescope in late-September. The failure halted almost all science operations on the orbiting observatory. Audio of the teleconference will be streamed live at: http://www.nasa.gov/newsaudio"
Notes: There is very little aging that goes on with an unpowered component in space. It is a very benign storage environment. We have very good confidence that this will work. The spare unit on the ground was delivered in 1992. Getting everyone back up to speed when the unit was delivered in 1992 is a bit of a challenge. The unit will start testing some time next week - that testing will go on for several months. This is a Block 1 orbital replacement unit. It is held on by 10 bolts and a single connector. It was made to be one of the easiest things to replace. We will have a better handle on the status of the hardware in the first week of November. By Keith Cowing on October 14, 2008 10:51 AM. "Whatever the outcome, the space economy is expanding all around us, and if we do not make the commitment to a comprehensive national space strategy and fully funding it, we will most assuredly see our nation's economic and technological standing fall behind our competitors. If we find it in the national economic interest to provide for a $700 billion bailout to Wall Street, we can surely make the relatively modest investment -- less than 3 percent of the bailout funding -- needed in space exploration, technology, research and science to ensure continued U.S global economic and technological leadership in the future. Commitment to space is vital to our economy." By Keith Cowing on October 14, 2008 9:37 AM. "Garriott will share his experiences through his Web site, www.richardinspace.com. The site's "Tracking The Mission" section will feature live and playback video from NASA TV and Garriott will also be responding to questions posed on his site via audio recordings, direct from space." Live Challenger Center Broadcast with the ISS: Kids Ask Citizen Cosmonaut "What Are You Looking For in Space"? "Richard Garriott, plans to talk with students through a NASA sponsored live video teleconference, broadcast via the Internet on October 20th at 1:00pm ET during his flight to the International Space Station. The downlink event will be held in Reston, Virginia in coordination with KZO Innovations with students from two D.C. Metropolitan area schools and four Challenger Learning Centers." "Richard Garriott plans to talk to students through live amateur radio downlinks during his October flight to the International Space Station. The downlink events will be held during Garriott's flight and are currently scheduled for 12:30pm Thursday, October 16th and Friday, October 17th with middle school students from Challenger Learning Centers across the country." By Keith Cowing on October 14, 2008 12:44 AM. "Last week, a group of visiting business executives caught a glimpse of life in space as they climbed into the tiny room. The door slammed shut and the dome-like structure filled with pressurized air, causing the suit-clad guests' ears to pop. They were impressed, almost as much as they were with the flight simulators and the world's largest wind tunnel they had seen earlier. They had no idea, they kept saying, that so much "cool stuff" was just 150 miles south of Washington." Editor's note: Um, and there is cool stuff at GSFC just outside the Beltway, at APL a bit further as well as STScI, out at Wallops where they can actually put things into space, and in West Virginia at IVV. Oh and they build all kinds of fascinating things at Orbital next to Dulles Airport. The fact that local legislators - and the media - are surprised about all of this points to a chronic failing at NASA. The agency is hidden in plain sight. Yawn. Then again, NASA DID try hard - the FolkLife Festival this summer on the National Mall here in Washington, DC was really quite an accomplishment. I guess the answer is simple: in order to demonstrate how NASA is indeed relevant, the agency needs to be in the face of the public - and the media - and all levels of government - 24/7/365 through whatever means necessary. By Keith Cowing on October 13, 2008 4:42 PM. Editor's note: I think this guy has a valid point. Video below. Continue reading Astronaut Suspects NASA Using Him To Test Space's Effects On Fat People. By Keith Cowing on October 12, 2008 12:09 PM. "Space Adventures, Ltd., the only company that provides human space missions to the world marketplace, today announced that its orbital client Richard Garriott and his crew successfully launched aboard a Soyuz TMA spacecraft from the Baikonur Cosmodrome in Kazakhstan en route to the International Space Station (ISS). Garriott joins the Expedition 18 crew, which includes NASA astronaut Michael Fincke and Russian cosmonaut Yuri Lonchakov. In preparation for his spaceflight, Garriott, son of NASA astronaut Owen Garriott, completed a cosmonaut-training program at the Yuri Gagarin Cosmonaut Training Center located in Star City, Russia. This historic mission marks Garriott as the world's 1st second-generation astronaut." By Keith Cowing on October 11, 2008 8:40 PM. "Almost half of the 21 fluorescent lamps aboard Japan's experimentation module Kibo on the International Space Station (ISS) have burned out, the Japan Aerospace Exploration Agency (JAXA) said. JAXA officials said if more than half of the lamps are unusable, it will affect experiments and other work in the module." By Keith Cowing on October 11, 2008 6:12 PM. Airs 14 October on PBS. By Keith Cowing on October 11, 2008 4:07 PM. "The ongoing global economic turmoil and increasingly strained ties between Moscow and Washington will not stand in the way of further space exploration, Russia's space agency chief said Saturday." "I doubt that the ISS crew will be increased to six people from next year because the final decision has not been taken yet," Roscosmos head Anatoly Perminov said. "All countries participating in the ISS program have to decide it." "Plans to increase the crew of the International Space Station from three to six astronauts in 2009 may be delayed, the head of the Russian space agency said Saturday." By Keith Cowing on October 11, 2008 12:52 AM. Editor's note: Word has it that Buzz Aldrin is organizing an event on 5 November - the day after the election - in Washington DC, to discuss the future of American space policy. Stay tuned. By Keith Cowing on October 11, 2008 12:36 AM. "SPACEHAB, Incorporated, a leading provider of commercial space services, today announced its receipt of a NASDAQ Staff Determination letter on October 7, 2008 indicating that the Company has failed to regain compliance with NASDAQ Marketplace Rule 4310(c)(4), and that its securities are, therefore, subject to delisting from The NASDAQ Capital Market. The Company plans to request a hearing before a NASDAQ Listing Qualifications Panel to present its plan of compliance and request continued listing pending the completion of the plan. However, there can be no assurance the Panel will grant the Company's request for continued listing." By Keith Cowing on October 10, 2008 7:11 PM. "About 48 hours after having posted a short example on Columbus, I hope you have reached some conclusions. I'd like to continue this discussion just a bit longer." "I had great hopes for this paper. After I read it, I felt disappointment. I slept on it. I read it again this morning. I am still disappointed. Probably it is not fair; the attempt to learn lessons from history is always a noble one. Perhaps this is just too big a topic to address in a short academic paper. So rather than criticize, lets take a look beyond the Venn diagrams and explore for the golden nuggets of wisdom that come with a deep understanding of the lessons that history of exploration can teach us. The Strathclyde study said that Columbus's voyages were a tactical ("program") failure and a strategic success. Really?" By Keith Cowing on October 10, 2008 6:58 PM. Continue reading What the MSL Bailout Looks Like. By Keith Cowing on October 10, 2008 6:27 PM. 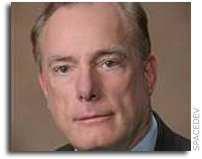 "SpaceDev, Inc. announced today that SpaceDev Founder and Board Member James Benson, 63, died peacefully in his home. Benson was diagnosed in 2007 with a glioblastoma multiforme brain tumor, the cause of his death early this morning. Mr. Benson had resigned from an operational role in SpaceDev in September 2006. He retained a seat on the Board of Directors of SpaceDev where he had continued to support the Company that he founded in 1997." By Keith Cowing on October 10, 2008 6:15 PM. "The Planetary Science Subcommittee of the NASA Advisory Council (NAC) reports to the Science Committee of the NAC. Regular meetings are held for the purpose of soliciting from the scientific community and other persons scientific and technical information relevant to program planning. Presentations from the Subcommittee meetings will be posted on this unofficial site." By Keith Cowing on October 10, 2008 3:30 PM. Editor's note: Last year, before Ed Weiler came back to NASA Headquarters to be the Associate Administrator for NASA's Science Mission Directorate, an internal cost study was done to see how much SMD overruns every year on its various projects and missions. That study showed $5.4 billion of cost increases over a 4 year period. The goal posts for this study involved measuring costs starting from either the cost contained in the FY 2005 budget or, if the project started later, from its Phase B cost. The costing period then extended forward to the amount that it had increased to for the FY 2009 budget submission. This large lump of overruns did not sit well with Ed Weiler, so he decided to order folks to make it go away. How to do it? Simple: just move the goal posts. In so doing, you use Congressional guidance (Nunn-McCurdy) as a smoke screen to hide the true magnitude of cost increases. Continue reading NASA SMD's Cost Overrun Coverup (updated with Telecon notes). By Keith Cowing on October 10, 2008 10:17 AM. The following information was released by campaign office of Senator John McCain: "This week marks World Space Week. Celebrated across the US and in over 50 nations, World Space Week is another great example of international cooperation for a common cause. Its goal is to inspire the workforce of tomorrow and educate the public about space. Participants include NASA, aerospace companies, planetariums, museums, schools, and others around the world. "I'm glad to see this annual public and student focus on space. Indeed, for Americans to excel in the world marketplace, our young people must excel in math, science and engineering. The U.S. government and commercial space sector provides many opportunities for students with an exciting and long-term vision for the future by developing the technologies that will take us beyond low-Earth orbit." 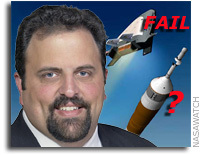 Ed Weiler, The Next NASA Administrator? By Keith Cowing on October 10, 2008 9:47 AM. Editor's update: I received this note this morning from someone very close to Ed Weiler at NASA. I stand by my reporting and the multiple, overlapping sources that I used to write it. Also, just so that everyone is clear, NASA employee private lives (as are mentioned in this note) are utterly off limits - they always have been, aways will be. I understand, however, that Dr. Weiler would like this to be known. That said, perhaps Ed Weiler will take this episode to heart as he continues to expound on who should or should not be the next Administrator of NASA - and the continuing and persistent way in which he goes about dumping on those people he does not like - in the presence of others. "Your whole premise is wrong and must be based on sources who really don't understand or don't want to understand reality. Anyone who knows Weiler personally, knows that not only doesn't he have ANY interest in the administrator's job, he couldn't accept the job due to very problematic issues in his family life that do not allow him to travel extensively as the administrator must." Editor's update: With the election less than a month away people are beginning to jockey for position in case Mike Griffin does not stay on as NASA Administrator. Given the prevailing view among both campaign staffs and likely transition team members, the chances that Mike Griffin will be asked to stay on permanently are rather slim. Of course, things change. Continue reading Ed Weiler, The Next NASA Administrator?. By Keith Cowing on October 9, 2008 9:39 PM. "The 2008 edition of NASA's annual Spinoff publication celebrates the agency's 50th anniversary and highlights 50 new examples of how NASA technology is being put to use in everyday life. This anniversary edition features a 50-year timeline of NASA-derived technologies from historical programs and projects, and a summary of award-winning NASA technologies included in Spinoff over the years. Spinoff 2008 lists many of the latest NASA innovations now in the commercial marketplace. These innovations have resulted in healthcare advances, transportation breakthroughs, public safety benefits, new consumer goods, environmental protection, computer technology and industrial productivity." By Keith Cowing on October 9, 2008 7:36 PM. "NASA will host a media teleconference at 3 p.m. EDT, Friday, Oct. 10, to brief reporters after a meeting held by the agency's administrator concerning the Mars Science Laboratory, or MSL. The meeting is to discuss technical and budget issues." Editor's note: In other words: "how do we kick the can down the road past the election so that a new Administration can deal with it? There's certainly no one left who cares to answer the phone at The White House any more." By Keith Cowing on October 9, 2008 4:00 PM. Dear members of the ESMD listserv... As many of you have undoubtedly heard by now, I have decided to take a position with the Office of Commercial Space Transportation (AST) within the FAA. AST is responsible for issuing licenses and permits to companies like SpaceX who want to launch rockets commercially. Continue reading Ken Davidian Heading for FAA AST. By Keith Cowing on October 9, 2008 11:40 AM. "For example, NASA estimated last March that there were 8,000 shuttle and Constellation contractor positions at KSC. But Wednesday's update cited a total of 7,300 jobs. Joel Kearns, head of the NASA Constellation transition team, said the discrepancy was due in part to contractors eliminating some positions from KSC as the shuttle finishes its mission to build the international space station. Also, he said, some contractors have not filled jobs vacated by workers who quit or retired." "NASA officials said they expect to see the numbers change even more as they learn more about the requirements for the new program. They remained adamant about the fact that they still expect the overall workforce to shrink. "The reality is the new systems are being designed to operate with far fewer people," NASA spokesman Allard Beutel said Wednesday." By Keith Cowing on October 9, 2008 12:42 AM. "By using solar sailing - rotating the spacecraft and tilting its solar panels to use the very small pressure from sunlight to alter the spacecraft's trajectory - MESSENGER navigators have achieved a new record for the smallest miss distance between the intended and actual closest approach distance during a flyby of a planet other than Earth. On October 6, 2008, the probe flew 199.4 kilometers (123.9 miles) above the surface of the planet. "Our goal was to fly 200 kilometers from the planet's surface, and we missed that target by only 0.6 kilometers," explained MESSENGER Mission Design Lead Jim McAdams." By Keith Cowing on October 8, 2008 10:36 PM. Image of Impact of asteroid 2008 TC3 over Northern Sudan, observed by EUMETSAT's rapid-scanning service. Meteosat-8 IR3.9 - 07/10/08 02:45 UTC. Reader note: "For over a day now http://neo.jpl.nasa.gov/news/news160.html promises "forthcoming" details about apparently very detailled observations of the airburst by asteroid 2008 TC3 yet nothing has been released. This sounds like data from an early warning satellite as these have yielded precise measurements of such (non-predicted) airbursts before. Your vast network of sources should be able to confirm that in no time ..."
By Keith Cowing on October 8, 2008 8:01 PM. Colleagues: This weekend, Goddard lost a member of its family with the passing of Dr. Beth Brown, the Director for Science Communication and Higher Education for the Science and Exploration Division. Her loss was sudden and unexpected and it has left us all with a sense of profound sadness. Dr. Brown was one of Goddard's rising stars. She was only recently appointed to this new position in Code 600, after having completed a 2-year NASA Administrator Fellowship. By Keith Cowing on October 8, 2008 5:10 PM. "The National Institute for Occupational Safety and Health revealed the results of an investigation into two buildings at the NASA Glenn Research Center in Cleveland which aimed to determine whether the buildingd caused cancer in employees. The federal agency determined that the buildings were not the cause of cancer in 65 past and present employees. The results were released Wednesday following concerns by a union." By Keith Cowing on October 8, 2008 5:06 PM. "Boasting one of the more eclectic guest lists in recent memory, Brazilian-influenced duo N.A.S.A. will unveil its debut album, "The Spirit of Apollo," Feb. 17 via Anti-. ... N.A.S.A., which stands for "North America / South America," is staffed by Squeak E. Clean (composer/producer Sam Spiegel) and DJ Zegon (skateboarder Ze Gonzales). The duo has been working on the album for five years ever since conceiving it at a party in Brazil." By Keith Cowing on October 8, 2008 5:00 PM. "NASA is releasing an updated version of the Work Force Transition Strategy Report, which was delivered to Congress on Wednesday. The report details the agency's plan to minimize job losses while transitioning from the Space Shuttle Program to the Constellation Program. The initial report was submitted to Congress on March 31, 2008. The next update will be submitted to Congress in spring 2009." By Keith Cowing on October 8, 2008 1:50 PM. "... we deplore the hysterical reaction by HQ management. Their over-reaction is not helpful and is likely making things worse. Remember this spending restriction was a Senate reaction to true NASA management excesses; NASA management should repent and pledge to take the brunt of the medicine, rather than showing contempt and passing on the pain to its technical employees." By Keith Cowing on October 7, 2008 10:46 PM. "NASA plans to tell Congress Wednesday that the retirement of the space shuttle in 2010 won't result in as many job losses as initially anticipated, according to congressional sources and documents obtained by the Orlando Sentinel. A rosier forecast would be a boon for Kennedy Space Center, which has been told to expect a worst-case estimate of 6,400 job losses. Some officials say that NASA is forecasting at least 1,000 fewer job losses, and that the worst case number of job losses now is likely to be less than 5,000." By Keith Cowing on October 7, 2008 3:46 PM. "This report examines a number of exploration campaigns that have taken place during the last 700 years, and considers them from a risk perspective. The explorations are those led by Christopher Columbus, Sir Walter Raleigh, John Franklin, Sir Ernest Shackleton, the Company of Scotland to Darien and the Apollo project undertaken by NASA. To provide a wider context for investigating the selected exploration campaigns, we seek ways of finding analogies at mission, programmatic and strategic levels and thereby to develop common themes. Ultimately, the purpose of the study is to understand how risk has shaped past explorations, in order to learn lessons for the future. From this, we begin to identify and develop tools for assessing strategic risk in future explorations." "By contrast, Apollo achieved its goal of putting men on the moon before the Russians, but the equipment used had no application for other projects. The programme cost 70bn in today's money. Nasa has since struggled to find a reason to put men into space; hence the interest of executives setting up the Constellation programme which will take astronauts back to the moon next decade and later to Mars. 'We presented our study to senior Nasa managers, including Jeff Hanley, head of the Constellation programme,' said Bedford. 'We made it clear we are risk analysts, not historians... We also made it clear that even failed expeditions can teach us something." Editor's note: NASA has sent me a copy of the report - and the report is also posted online. Continue reading NASA Releases Exploration Study. Applying NASA Budget Smarts on Wall Street? By Keith Cowing on October 7, 2008 12:03 PM. 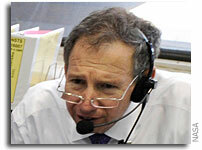 "Does it take a rocket scientist to fix the country's world's financial mess? Well, maybe ... (hopefully!) Neel Kashkari, 35, has a new title on his resume: Interim Assistant Secretary of the Treasury for Financial Stability. He was appointed to the job yesterday by Treasury Secretary Henry Paulson, who is either Dr. Evil or Santa Claus. I can't decide which. One of Kashkari's first jobs was with NASA contractor TRW in Redondo Beach, Calif., where he develop technology for a science missions including the James Webb Space Telescope. I hope it's not a bad sign that a diminutive version of the observatory Kashkari worked on is still on the ground, with launch scheduled for three years later than its original 2010 date." By Keith Cowing on October 7, 2008 11:11 AM. "Of Interest: Yesterday, at 4:40 am EDT, MESSENGER successfully completed its second flyby of Mercury. Today, at about 1:50 am EDT, the images taken during the flyby encounter began to be received back on Earth. The spectacular image shown here is one of the first to be returned and shows a WAC image of the departing planet taken about 90 minutes after the spacecraft's closest approach to Mercury. The bright crater just south of the center of the image is Kuiper, identified on images from the Mariner 10 mission in the 1970s. For most of the terrain east of Kuiper, toward the limb (edge) of the planet, the departing images are the first spacecraft views of that portion of Mercury's surface. A striking characteristic of this newly imaged area is the large pattern of rays that extend from the northern region of Mercury to regions south of Kuiper." By Keith Cowing on October 7, 2008 9:32 AM. "The NASA Authorization Act, H.R. 6063, which has passed both the House and the Senate, is awaiting signature by the President. It contains a new provision restricting National Aeronautics and Space Administration's (NASA) total authorized spending on conferences to $5 million in FY 09. This limit represents an over two-thirds reduction in spending from FY 08. NASA's systems and processes will need to be updated to ensure compliance with this new requirement. Until further notice, no FY 09 funds are to be committed, obligated or disbursed to sponsor, travel to, or pay admission to an international or domestic conference. No commitments or obligations to conference facilities or hotels may be made using FY 09 funds. Conferences that are planned in the current quarter, or attendance at conferences in the current quarter, may proceed as long as only FY 08 funds are used for all participants. For example, any travelers attending the Advancement of Safety Conference this month may only use FY 08 funds for travel or fees." By Keith Cowing on October 6, 2008 11:12 PM. "NASA is in the conceptual phase of identifying key performance indicators for the successful design and production of the "Altair" (Lunar Lander) vehicle. Our goal is to meet NASA's Lunar Exploration requirements safely and at the lowest life cycle cost. As specified during the Industry Day meeting conducted September 25, 2008, NASA will be awarding multiple fixed price contracts in early CY 2009. This interim developmental design effort is intended to continue industry involvement and build on the knowledge developed under the Altair study contracts by supplementing the NASA design team emphasizing the areas of human space flight production, manufacturing, and operability. Contracts are planned to run into the 2012/2013 timeframe in support of the Altair Systems Requirements Review (SRR) and Systems Design Review (SDR)." By Keith Cowing on October 6, 2008 8:30 PM. "A tiny asteroid discovered just hours ago at an Arizona observatory will enter Earth's atmosphere harmlessly at approximately 10:46 p.m. Eastern time tonight (2:46 a.m. Greenwich Mean Time). There is no danger to people or property since the asteroid will not reach the ground. It is between 3 and 15 feet (1-5 m) in diameter and will burn up in the upper atmosphere, well above aircraft heights. A brilliant fireball will be visible as a result. "We want to stress that this object is not a threat," said Dr. Timothy Spahr, director of the International Astronomical Union's Minor Planet Center." Who Will Be The Next Administrator of NASA? By Keith Cowing on October 6, 2008 12:01 AM. Editor's update: This week: Ed Weiler's campaign to promote himself and discredit others - all while using smoke and mirrors - and moving goal posts. Editor's 23 Sep note: As the Bush Administration comes to an end, post-election speculation with regard to NASA has begun to take on some momentum. Will Obama or McCain keep Mike Griffin on? For what it is worth, my sources close to both campaigns (and potential transition teams) are rather blunt: "No" and No". Continue reading Who Will Be The Next Administrator of NASA?. By Keith Cowing on October 5, 2008 11:14 PM. "The operations team is now preparing for the period of time about an hour prior to closest approach [at 4:40:21 a.m. EDT], when we will be transitioning our support from the Canberra ground station to the Madrid ground station that will capture the flyby," Finnegan said. "High-gain communications with the spacecraft will be re-established on Tuesday at 1:14 a.m. EDT at approximately 52 kilobits per second, and playback of the data stored in the solid-state recorder will start approximately 30 minutes later." Continue reading MESSENGER Prepares to Buzz Mercury Again. By Keith Cowing on October 5, 2008 9:43 PM. "The United States has had periods in which its astronauts could not reach space: between the end of the Apollo program and the beginning of shuttle flights in 1981, and after the loss of the shuttles Challenger in 1986 and Columbia in 2003. But the coming interval could become the longest of all if the rollout of NASA's new rockets is significantly delayed." By Keith Cowing on October 5, 2008 2:13 PM. Laurent Lichtenstein: "The teaser of my very new documentary "New Moon", describing man's efforts to return to the Moon in 2020. Filmed mostly at Devon Island, canadian Hight Arctic"
Continue reading Today's Video: New Moon, the teaser. By Keith Cowing on October 4, 2008 11:09 PM. "Several college students, working at NASAs Johnson Space Center, teamed up to help their generation reconnect with NASA by creating entertaining videos that people might not expect from a government agency. Using their own resources and skillz, these young employees created a series of videos that educate and entertain." Editor's note: There are three videos in this collection. "Apollo Guys" is interesting and nicely done - but needs to be re-edited. "The Future of NASA" is cute. With regard to "I.S.S. Baby": if there is an "artist" who is more annoying than Vanilla Ice (even when copied - badly), please let me know. Continue reading Three Videos from JSC Students. By Keith Cowing on October 3, 2008 2:55 PM. "Top NASA managers will decide next week the fate of the Mars Science Laboratory, a nuclear-powered astrobiology rover that already has cost $1.5 billion and is likely to hit the 30-percent overrun ceiling that could trigger cancellation by Congress. Officials from the agency's Mars Exploration Program (MEP) and the Jet Propulsion Laboratory (JPL) are set to brief Administrator Mike Griffin and Science Associate Administrator Ed Weiler on the program next week." "Postponing MSL is a real possibility, and an unfortunate one," says Brown University planetary scientist Jack Mustard, who also chairs NASA's Mars science advisory panel. "A 2-year delay could increase the cost of the mission significantly--and that would come out of the Mars budget." He also fears that this could slow momentum for Mars exploration and jeopardize plans for a 2016 rover and a sample-return mission." By Keith Cowing on October 3, 2008 1:47 PM. "2:00 pm EDT: Ed Weiler, Associate administrator of the Science Mission Directorate, NASA Headquarters"
By Keith Cowing on October 3, 2008 1:44 PM. "With a successful Falcon 1 launch under their belt, SpaceX has set its sights on hauling cargo for NASA with the larger Falcon 9 rocket, transporting crews to the International Space Station in its Dragon capsule, and landing on the Moon with a modified Falcon 1 rocket." "3:00 pm EDT: Guest: Elon Musk, CEO and CTO, Space Exploration Technologies Corp. (SpaceX), Hawthorne, California"
By Keith Cowing on October 3, 2008 10:24 AM. "The spacewalk -- part of an ambitious manned space program that includes construction of a space lab and will likely feature a lunar landing -- was a reminder of the country's growing national might. "There are problems, yes, but the message of this is that the [Communist] Party has the right control policy because of all it has done," says Dean Cheng, China analyst with the CNA Corp., a U.S.-based think tank. Says Joan Johnson-Freese, a space expert at the Naval War College in Newport, R.I.: "The Chinese have read the Apollo playbook. They understand everything the U.S. got from its lunar program." "America has no choice but to find the will - and the money - to design and build the next generation of spaceships, and it must do so even as it solves the current financial mess, reinvigorates the economy, and defends against terrorism. Otherwise, space will become the province of nations that have the will, nations - like China - whose self interest may not coincide with ours." By Keith Cowing on October 3, 2008 9:55 AM. Editor's note: Word has it that the slip of STS-125 has caused a number of delays - including Ares 1-X which will slip from a target launch date of 30 June 2009 to NET Oct/Nov 2009. By Keith Cowing on October 2, 2008 2:54 PM. "A two-hour observation of Jupiter using an improved technique to remove atmospheric blur has produced the sharpest whole-planet picture ever taken from the ground, according to astronomers from the University of California, Berkeley, and the European Southern Observatory (ESO). The series of 265 snapshots taken with the help of a prototype Multi-Conjugate Adaptive Optics (MCAO) instrument mounted on the ESO's Very Large Telescope (VLT) revealed changes over the past three years in Jupiter's smog-like haze, probably a response to a planet-wide upheaval more than a year ago." By Keith Cowing on October 2, 2008 2:53 PM. "The landmark 10th anniversary of the Hubble Space Telescope's Hubble Heritage Project is being celebrated with a 'landscape' image from the cosmos. Cutting across a nearby star-forming region are the "hills and valleys" of gas and dust displayed in intricate detail. Set amid a backdrop of soft, glowing blue light are wispy tendrils of gas as well as dark trunks of dust that are light-years in height." By Keith Cowing on October 2, 2008 2:52 PM. 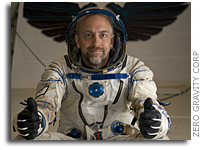 "Space Adventures, Ltd., the only company that provides human space missions to the world marketplace, announced today that their orbital spaceflight client, Richard Garriott, will participate in a suite of experiments in cooperation with NASA during his 10-day mission. Mr. Garriott is scheduled to launch on October 12 onboard a Soyuz TMA spacecraft from the Baikonur Cosmodrome in Kazakhstan en route to the International Space Station (ISS). He will be joining the Expedition 18 crew which includes NASA astronaut Michael Fincke and Russian cosmonaut Yuri Lonchakov." By Keith Cowing on October 2, 2008 2:51 PM. NASA IG: Annual Report, "Federal Information Security Management Act: Fiscal Year 2008 Report from the Office of Inspector General"
"Based on the work we performed, we agree that IT security is no longer a material weakness. However, while there is improvement in internal controls through establishment of management programs and processes, we have not determined the effectiveness of these controls in reducing IT security threats. Whether management programs and processes can effectively demonstrate results can only be determined over time." By Keith Cowing on October 2, 2008 2:00 PM. "The Office of Inspector General conducted an audit of NASA's Integrated Asset Management - Property, Plant, and Equipment (IAM/PP&E) module. A component of NASA's Integrated Enterprise Management Program (IEMP), the IAM/PP&E module is an automated asset-management system that performs two main functions: equipment management (logistics) and asset accounting (finance) and was designed to integrate logistics and financial processes to account for and facilitate management of NASA personal property."